Unseen Westeros is an ambitious project by a group of matte painters and visual effects artists who have all worked on HBO’s Game of Thrones. With the approval and support of George R.R. Martin, German publisher Penhaligon, and Westeros.org, the artists have produced scores of paintings depicting locales from The World of Ice and Fire, many of them first introduced in that book. Suffice it to say, it’s very flattering to have been a part of something that has inspired so many artists. Linda and/or I are likely to attend one or more of the days of the exhibition, and we may have some more to announce in that regards down the road. We’ve seen quite a bit of the art, and suffice it to say these artists are all extremely talented, and it’s remarkable to see how they bring some of the many fascinating, strange, or epic locales described in the world book to life. The exhibition is targeting January 23rd to January 27th, with an impressive venue—a former powerplant in Berlin—for the art to be displayed in. Of course, all these things cost, and the project has a Kickstarter to help cover the costs (which they itemize). Supporters to the Kickstarter can get anything from a credit on the backers’ wall at the exhibition to an album from official exhibition music composers Wolf & Moon and on through a limited edition art catalog or even (at the 2500+ euro level—two of those are gone, already!) an original painting. To learn more about the project and support it, visit the Kickstarter. To apply for free tickets in advance, go to Eventbrite. Keep an eye out on our Youtube channel, as we’ll be making a video or two responding to some as-yet-unseen artwork to give everyone a taste of what’s to come! As we’ve noted in our recent Game of Thrones news roundup, Linda and I were away to Northern Ireland this past weekend on a trip sponsored by Tourism NI to see the Winterfell Festival at the beautiful Castle Ward estate that served as a filming location for Winterfell and much, much more. It marks my fourth visit to Northern Ireland, and each time has been a pleasure from the very first visit to look at the set and watch some of the filming with George to the previous visit thanks to Tourism NI to see the beautifully carved Doors of Game of Thrones, and now on to this one. We’ve captured a lot of photos and video footage from the junket, just over 30 gigabytes. Keep an eye out over the coming days for posts and videos featuring some of the iconic locations, and even actors—we met with Mark Addy and Ian McElhinney when they were there at Castle Ward, and filmed a lengthy interview McElhinney held before an audience that we’ll publish soon. And as it happens, some of the treasures are still coming—such as the following treat from Boyd Rankin, weaponmaker-extraordinaire responsible for many of the iconic weapons on the show who also served as Mikken on season 1 on the show (he says it was his well-worn, slightly charred leather apron that was cast) . We’ve already shared a couple of photos on our Instagram from seeing Boyd at Castle Ward, featuring an image of the original Longclaw before it was burned, bear’s head-pommel and all, and another of a new memento for us in the form of a knife made for season 4 that was never used…. but this is a bit different. Last night, George R.R. Martin and John Picacio took the stage at the historic Fox Theatre in Redwood City for what turned out to be two and half hours of conversation and Q&A. We believe the SF in SF organization, along with co-sponsor of the event Locus Magazine, will be posting the audio (and perhaps video) of the full event at their site, but in the meantime there have been reports, and even a bit of video. One of the detailed reports from the Q&A comes from Twitter user clintw, which we’ve threaded and posted to the So Spake Martin collection. In the course of the interview and Q&A, Martin remarks on the name of the latest Princess of Dorne, the whereabouts of the Valyrian steel sword Dark Sister, hints about the various ideas HBO is still exploring for successor shows, and more. Worldcon 76 is coming to San Jose in August, but a couple of days prior to this the SF in SF organization has put together a special event: an evening with George R.R. Martin and award-winning artist John Picacio. Organized as a benefit for Locus Magazine, the chief trade magazine of SF/F publishing, the event promises to feature “a discussion on literature, art, and life” between the famed writer and artist. Signed copies of their works will be available for purchase. The event takes place at the Fox Theatre in Redwood City on August 14, the Tuesday before Worldcon. For more information, see the event site. We’re sad to share the news that actor Roy Dotrice, whose collaborations with George R.R. Martin began with Beauty and the Beast and continued right through providing his voice to the audiobook of The World of Ice and Fire, has passed away at the age of 94. Dotrice was well known on stage and screen, and genre fans will have seen him in a host of notable shows such as Babylon 5, Buffy the Vampire Slayer, and (of course) as the pyromancer Hallyne in Game of Thrones. Linda and I corresponded with him briefly, years ago, and remember him as a perfectly gracious, charming person who seemed amazed and pleased with the enthusiasm for his recordings of the novels. He’ll be much missed. 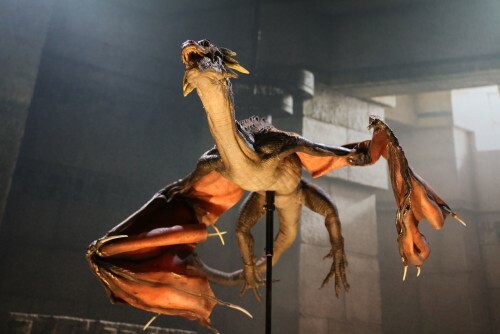 Do dragons actually exist? Is it possible to crush a person’s head with your bare hands? What really happened when royal families interbred? How does wildfire win wars? Can you really kill someone with molten gold? These burning questions (groan) will be bravely tackled by our crack team of Game of Thrones experts. Join Maesters Helen Keen, Dr Gerardo GarcÃ%ADa, and Elio GarcÃ%ADa as they discuss the science behind the Seven Kingdoms under the skeptical eye of Grand Maester Deborah Hyde. With luck and careful analysis we may at last discover the airspeed velocity of an unladen Westerosi raven. QED tickets are still on sale, and you can pick yours up today. Linda and I recently published a video on our Westeros.org youtube channel regarding annulments in Westeros. This is in reaction to something on Game of Thrones—Linda explains more in the video—but suffice it to say, it contains spoilers for season 7 of the series. Update: We’re pleased to say that we’ve been invited by Casa del Libro to sign at their store at Gran Via 29 prior to the talk. The signing will be from 5pm to 6pm. Linda and I will be speaking at Espacio FundaciÃ³n TelefÃ³nica, who have kindly invited us with the collaboration of the Spanish publisher of A Song of Ice and Fire and our The World of Ice and Fire, Gigamesh, the organizers of the Celsius 232 convention, and streaming source of Game of Thrones in Spain Movistar+. A few years ago GRRM took part in a similar event. Fans in Madrid can visit the event page for information regarding the time and details of the event, as well as reserving a free pass. For those who can’t make it, the website will stream the event live. As always, we’re very much looking forward to visiting Spain. That said, since we’re traveling late Sunday evening, busy in Madrid on Monday, and traveling homeward on Tuesday, Linda’s coverage of the season premiere will likely be delayed and/or be briefer than normal. Last week we shared reports that an adaptation of Nightflyers—based on the rights to the film made in the 1980s based on George R.R. Martin’s award-winning SF horror novella—was in the works. Now The Wrap reports that SyFy has gone ahead and ordered a pilot to produced based on the script by Jeff Buhler. 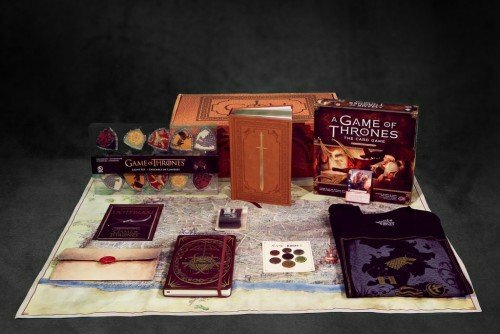 The New Year has begun, and Random House has informed us that this Friday—January 6—will be the last day they will be taking orders on the GRRM Box with its collection of collectibles and goodies for fans of both A Song of Ice and Fire and HBO’s Game of Thrones. Thanks to Random House, we’re glad to say that fans can order any of the available boxes at 15% off with the code LASTCHANCE if they order here. For more about the GRRM Box, you can read our announcement post sharing the full details.